Views the nation’s rail services are being prioritised over bus services have been perpetuated with the release of the New South Wales 2013-14 Budget. Total infrastructure expenditure in NSW will total $59.7 billion over the four years to 2016-17, including $15.5 billion in 2013-14. But while BusNSW Executive Director Darryl Mellish acknowledges the Government’s proposed record spending for infrastructure and services, he says the allocations for new and replacement buses are still at basic levels. Mellish says the allocations do not reflect the growth needed to capture the 40 percent patronage growth predicted by Government during the next 25 years. "It would appear that funding has instead gone to light rail projects based on political criteria rather than a detailed analysis of rapid transit systems," Mellish says. 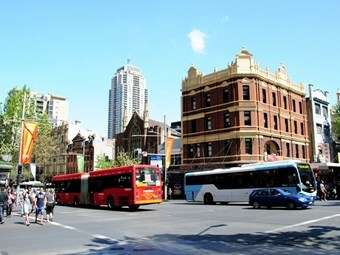 "However this is yet to be confirmed pending the release of the Sydney Bus Futures’ Report. "The bus industry considers properly planned and considered BRT can provide at least equal capacity to LRT (light rail transit) but provide greater flexibility and a much cheaper price tag." The Budget forecasts bus lane length will be 160.2 km in 2013-14, up from 159.50 km in 2012-13, and predicts more than 210 million people will board metropolitan buses in 2013-14, up from 207 million people in 2012-13. "It is interesting to note the Budget papers show good metropolitan bus services patronage growth and an increase in the length of bus lanes," Mellish says. But he says on-time running figures for the State Transit Authority (STA) still show the need for more bus priority programs due to an increase in congestion problems. Mellish says it is also concerning the Budget does not appear to provide for the rollout of improvements to the CCTV and duress alarm systems needed to improve safety and security across Sydney. Meanwhile, the Australasian Railway Association (ARA) has commended the Government for ‘one of the most comprehensive state budgets for the rail industry this nation has seen’. ARA CEO Bryan Nye says the rail industry has long been calling for greater investment in passenger rail infrastructure throughout NSW. He says funding commitments for key rail projects will not only ease Sydney’s congestion, ‘but will trigger the much needed shift of moving people and freight off the overcrowded and bottlenecked roads and on to the more efficient and environmentally sustainable tracks’. "To achieve the true benefits of rail: less cars on our roads, improved productivity, greater connectivity with regional areas, less greenhouse gas emissions and safer transport, we need robust political leadership and sound decision making." In the 2013-14 Budget, $806 million has been allocated to the North West Rail Link and $353 million to the South West Rail Link. $67 million is allocated to the Inner West Light Rail Extension from Dulwich Hill to Lilyfield, $75 million to the CBD and South East Light Rail project, and $66 million to rail infrastructure works to support the continuing delivery of Waratah trains. $50 million will go to the Rail Clearways program to improve the CityRail network, and $2 million to continue planning the second harbour crossing as part of Sydney’s Rail Future. Meanwhile, $945 million is allocated for metropolitan and outer metropolitan bus services, including financing costs of 201 new replacement and growth buses worth $92 million. The Budget also allocates $388 million to rural and regional bus services including school services in country areas, and $18 million to continue building infrastructure to support bus-priority on key corridors. $15 million has been allocated to new bus depots to accommodate growth in the bus fleet, and $11 million for continuing to provide expanded Night Ride bus services. $133 million has been assigned to continue implementing the Opal card integrated electronic ticketing system for Sydney, the Blue Mountains, Central Coast, Hunter, Illawarra and Southern Highlands. The Budget also include $476 million for public transport concession schemes, $50 million for the transport component of the Home and Community Care program, and $3 million for community transport services continuing the commitment to boost funding from 2013-14 onwards. The State Government has allocated about $15.5 billion in capital investment for 2013-14. The level of infrastructure investment for the top 20 agencies accounts for $14.6 billion. Top of the list for investments in agencies is Roads and Maritime Services, at $3,168 million, followed by Transport for NSW, at $2,619 million, and Rail Corporation NSW, $1,485 million. Major investments for the four years to 2016-17 include rail projects such as the North West Rail Link ($4.1 billion), rail fleet replacement ($1 billion) and the Transport Access Program ($496 million). Also to be invested during the four years to 2016-17 are bus fleets ($453 million), electronic ticketing ($237 million), CBD and South East Sydney Light Rail ($423 million), and ferries ($75 million).